Book Review: 'The Night Witches,' By Garth Ennis And Russ Braun Garth Ennis' new graphic novel creates a fictional character to flesh out the stories of the real Night Witches, Soviet female pilots who dropped bombs on the Nazis from rickety old biplanes. Reading the graphic novel The Night Witches, about female pilots who flew for the Russians in World War II, I thought about Jane Austen. More specifically, I thought about Helena Kelly's 2017 book Jane Austen: The Secret Radical, which issued an audacious call to incorporate creativity and imagination into women's history. Noting that information about her subject is riddled with "so many gaps, so many silences," Kelly feels free to invent "an imaginary Jane Austen." The novelist herself would have approved, Kelly contends: "It's in fiction, Jane says, that we should look for 'the most thorough knowledge of human nature.'" If women's history sometimes needs fictional stories to flesh it out, it needs them most of all when it comes to women's role in war. In fact, Garth Ennis was inspired to write The Night Witches by the great historian John Keegan's shocking dismissal of the very possibility that women have been fighters. Ennis quotes Keegan's A History of Warfare: "'Warfare is ... the one human activity from which women, with the most insignificant exceptions, have always and everywhere stood apart ... [women] never, in any military sense, fight men.'" 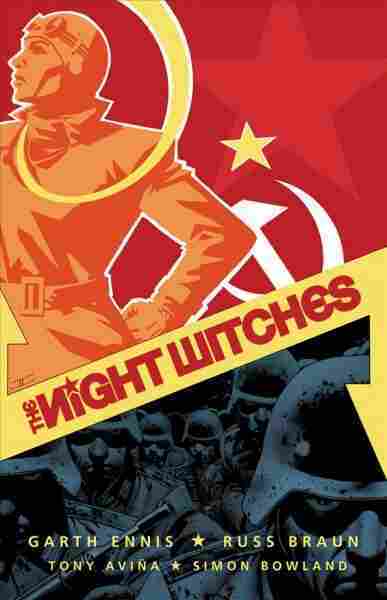 Ennis set out to rectify this assumption with The Night Witches — originally published in 2009 and newly reissued. Like Kelly, though, Ennis ran into a shortage of source material. Despite the efforts of recent researchers like Anne Noggle, who interviewed veteran flyers for 1994's A Dance With Death: Soviet Airwomen in World War II, little is known about the real lives of the Night Witches — or more properly, the 588th Night Bomber Regiment. After the war, the Soviet government downplayed the role of female personnel, and the women themselves were told not to talk about their experiences. And so Ennis invents Anna Kharkova, a composite of female pilots from the same period. With this fiction, he does a remarkable service to women's history. There are other books about the Night Witches, but none could possibly be this much fun. Anna, who's so short she has to sit on a cushion in the cockpit, is sent with a handful of other women to fly nighttime raids across enemy lines — a mission with, at best, tepid support from the brass. The women are relegated to flying rattletrap biplanes so out-of-date and noisy, they dub them "sewing machines." They have to turn off the engines and glide toward their targets so the Germans won't hear them coming. Even so, they're able to do plenty of damage to German equipment — and to the enemy soldiers' nerves. It's the Germans who dub the women flyers "Nachthexen." Ennis has Anna turn up everywhere from the Battle of Kursk to the fringes of the Korean War. She finds herself on the wrong side of both the German and Soviet governments, doing time in two different prison camps. She has various love affairs, but remains a fighter to the end — as is evident in the book's most page-turning episode, when she's shot down behind enemy lines. Anna may be female, but she teaches the enemy not to underestimate her. There are other books about the Night Witches, but none could possibly be this much fun. Ennis' secondary characters aren't as complex as Anna, but her fellow flyer Zoya shines. All the characters are realized more through their dialogue and actions than through Russ Braun and Tony Aviña's art, which tends to look stiff when people express strong emotions. In every other respect, though, Braun and Aviña's work is downright glorious. Scenes of ferocious dogfights, with planes peppered by bullets or exploding in midair, are as gripping as they are beautiful. Back on the ground, Braun draws people with formal precision and an almost frozen quality that makes every panel iconic. Aviña's colors are gorgeously versatile, ranging from subtly enameled tones for the people to flat, bright hues for the action in the sky. Most impressive of all is how vividly the artists show Anna's progression from eager recruit to cynical veteran. She remains recognizable even as experience scars her beyond belief. In this regard, she illuminates the nature of warfare, no matter who's fighting. Anna may be just a character, but she still represents an important contribution to women's history. In this field, fiction can tell vital truths — as even Jane Austen would probably agree.